I used to be a conservative. Over a decade or so, I became a moderate who saw much more value and effectiveness in a position that embraced the best of libertarian, conservative and liberal perspectives and policies. Dedicated advocates of those three rich streams in American political culture and philosophy will benefit considerably by recognizing the insights, contributions and disagreements in each other and choose to cooperate and negotiate. Extreme conservatism has been dominating a lot of political decisions in America since President Reagan’s term (whom I agree and disagree with on various points). It’s gone much too far. Extreme libertarianism is an idealistic mythology of unending freedom disconnected from the real limits regarding how basic human psychology, economics, natural resource management and sociology can actually function. Extreme liberalism can create the kinds of communist societies that Fox News tells us every day are encroaching or have already ingrained themselves into American life. The word “fearmongering” may get thrown around too often for particular people’s tastes, but some or a lot of it *is* going on here. I have a hard time empathizing with the apparent hatred and worry that a large portion of conservatives have toward socialism (even though they almost always want to keep their medicare, social security, business subsidies, etc.). Among a wide range of degrees, all modern industrialized nations utilize both socialist and capitalist economic models (including countries with a communist history like Vietnam, China, Russia, Laos, Cuba and North Korea). This combination can work very well as long as both systems are arranged to hold each other in check and allowed to contribute their multiple strengths toward the overall health and productivity of the society. Socialism ought not to be a threatening and suspicious word in the minds of conservatives just as capitalism doesn’t have to feel like a guaranteed symbol of oppression and abuse to liberals. We should be wary of extreme forms of either method and practice diligence in developing the best socioeconomic systems. Otherwise, we can feel reasonably safe to freely engage the opportunities available without dramatic apprehension. A large portion of the international community views the Republican Party as being more on the fringe than ever before, inviting their conservative impulses to reach the maximum setting. Developing a fair-minded evaluation in this context can be very difficult, but it’s worth pursuing. Passed healthcare reform, passed the stimulus, passed Wall Street reform, ended the war in Iraq, began drawdown of war in Afghanistan, eliminated Osama bin Laden, turned around U.S. auto industry, recapitalized banks, repealed “Don’t Ask, Don’t Tell”, toppled Moammar Gaddafi, told Mubarak to go, reversed Bush torture policies, improved America’s image abroad, kicked banks out of federal student loan program and expanded pell grant spending, created Race to the Top, boosted fuel efficiency standards, coordinated international response to financial crisis, passed mini stimuli, began “Asia” Pivot, increased support for veterans, tightened sanctions on Iran, created conditions to begin closing dirtiest power plants, passed credit card reforms, eliminated catch-22 in pay equity laws, protected two liberal seats on the U.S. Supreme Court, improved food safety system, achieved new START treaty, expanded national service, expanded wilderness and watershed protection, gave the FDA power to regulate tobacco, pushed federal agencies to be green leaders, passed fair sentencing act, trimmed and reoriented missile defense, began post-post-9/11 builddown, let Space Shuttle die and killed planned moon mission, invested heavily in renewable technology, crafting next-generation school tests, cracked down on bad for-profit colleges, improved school nutrition, expanded hate crimes protections, avoided scandal, brokered agreement for speedy compensation to victims of Gulf Oil Spill, created recovery.org, pushed broadband coverage, expanded health coverage for children, recognized the dangers of carbon dioxide, expanded stem cell research, provided payment to wronged minority farmers, helped South Sudan declare independence, killed the F-22. And for a super in-depth list, see “A List of 400 Accomplishments by President Obama so far…With Citations”. The meant to be scary warnings of America’s “soon coming demise” put forward by many far right-wing leaders did not come true, although many policies were enacted that they found abhorrent. In Obama’s first term he inherited the worst financial crisis and unemployment fiasco since the Great Depression of the late 1920s-1930s. 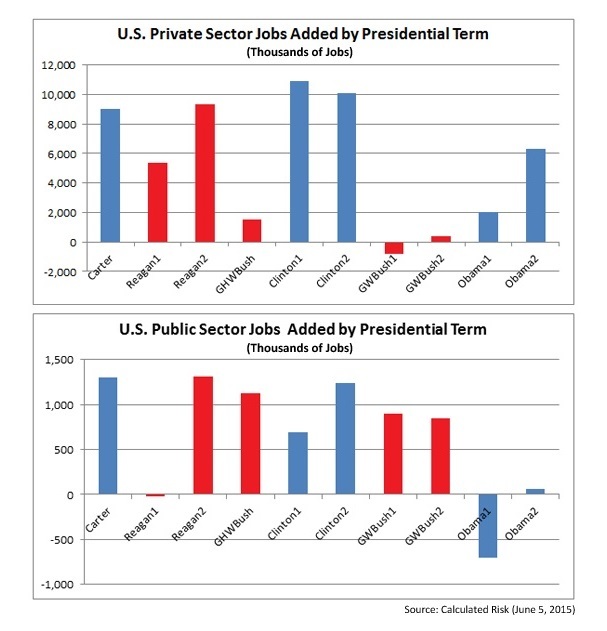 The subsequent economic recovery has been so substantial that not only is Obama’s second term already encompassing private sector job creation more than five times that of his first term, but overall it’s on pace to exceed that of Ronald Reagan’s sizable achievement in the face of another recession, although it was much less devastating than the 2007-2008 debacle. In the first few months of 2009, Obama implemented policies that helped to stop the rise of unemployment by October 2009 and then kept stabilizing and lowering it. The stats revealed by mid-2014 that more than 6 times as many non-governmental jobs were created under Obama than Bush, 7.7 million versus 1.3 million. Obama oversaw private sector job creation for more than 70 consecutive months, the longest in U.S. history. In a startling announcement, given how devastating the 2007-2008 crash had been, news outlets reported in December 2014 that the unemployment rate was the lowest since the late 1990s. This ought not to be surprising, given the historical trend – during Democratic presidencies since Truman, the average job creation rate has consistently been significantly higher than in Republican administrations. The last three Democratic presidents, Carter, Clinton, and Obama presided over the generation of more jobs (37.3 million) in 16 years than last six republicans, including Reagan, did altogether in 40 years (33.6 million). 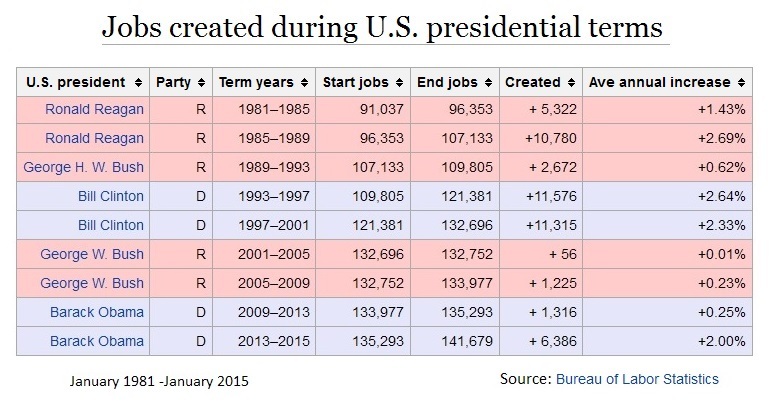 By itself, the Clinton administration outperformed our last five Republican presidents. The big data gathering able to make these points clear is the net job gain between 1932 and 2012, revealing a massive gulf in performance between red and blue American leadership and policy – 73.4 million for Democrats and just 34.8 for Republicans. Given all of this evidence, it’s remarkable that Democrats and the media don’t present these types of statistics adamantly and perpetually in a critique and challenge to the Republicans as they continue their endless propaganda saying they’re the party of job creation. By President Nixon’s secret order during the Vietnam War, the military flew large scale B-52 carpet bombing missions (1969-1973) into Cambodia and Laos that caused 100,000-200,000+ deaths. Overall, Obama and Bush have led the country during a time of more calculated and careful (though still fierce and often brutal) American military engagement. General evidence of this can be recognized since the losses in the Vietnam War (1965-1975) for both major sides were at least ten times that of the Second Iraq War (2003-2011), in conflicts that lasted close to the same number of years. In the earlier war, North and South Vietnamese together lost 1-3 million people and 58,000 Americans were killed. In the recent war, 100,000-300,000 Iraqis died and nearly 4,500 American lives were lost. The War in Afghanistan (2001-2014) took almost 2,400 American lives, about 26,000 from the Afghan government forces and 25,000-40,000 of the Taliban army. ISIS has lost more than 45,000 members through U.S.-led coalition attacks since 2014 and they’ve killed less than 100 Americans (including 4 soldiers and 50 civilians in the Orlando mass shooting in June 2016, in which the terrorist had no contact with their organization). The statistics above can serve as an example of differing military strategy, partly due to improved technological options, but also because of an increased desire to protect human life anywhere and everywhere. Carpet bombing jungles and entire cities and villages, especially when the enemy is only a small portion of the population is inhumane and ineffective. And, just as the methods of bombing needed to change to meet higher ethical standards and new types of threats, our budget for the Armed Forces must be flexible and able to maneuver when it becomes apparent that our current choice in strategy, structure or inventory is misguided. 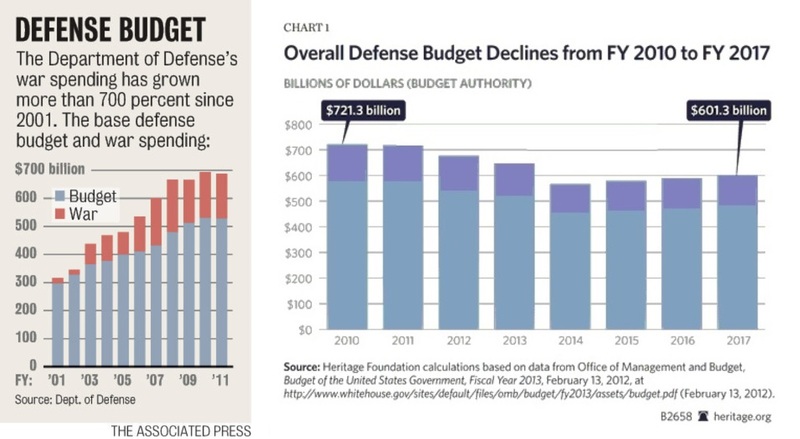 The 2016 defense budget coordinated with the Pentagon was at a level close to, if not above (depending on how it’s calculated) that of 2007, when the country was fighting two large scale wars. After all, our defense budgets are consistently not only the largest in the world by a very large measure, but beyond the size of the next half or full dozen countries combined (bigger than the next 13 in 2011 and outstretching the following 7 in 2014). Are the global threats really that extensive and necessarily so costly? 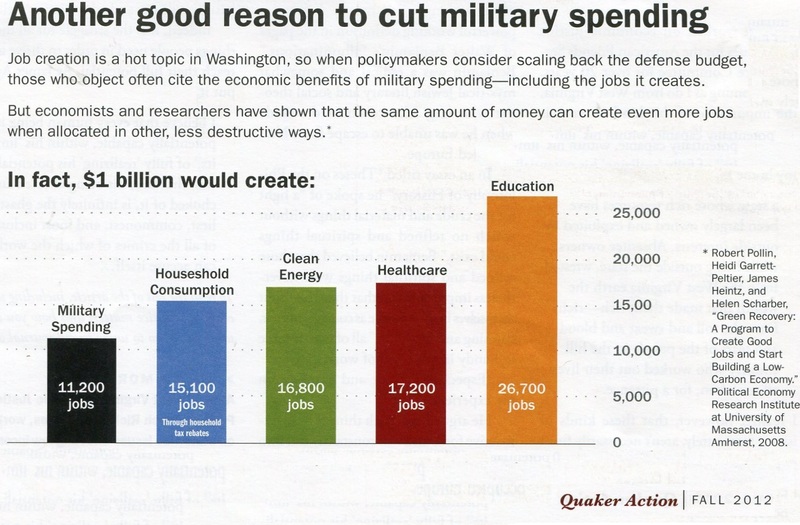 Enough to justify the $70-100 billion spent annually to maintain over 700 bases in over 100 foreign nations? All other major nations have a combined total of 30 bases outside their borders. There must be ways to make the operations of our Armed Forces more efficient and lean, while being sure that they remain the most effective and powerful fighting unit on Earth. I served in the U.S. Army Reserve for 5 years and can attest to the potential there for mismanagement, redundancy and gridlock just as within the various corporations, universities and charitable organizations that have employed me during my civilian career. That would seem to be an obvious insight, to say that human nature is universal no matter what the environment may be like. Yet, many Americans keep close to their hearts a deep intoxication and enamorment toward both adventurous soldiering and unfettered capitalism at such a profound level that it prevents them from seeing clearly the limitations and handicaps inherent in those fields (as is common in different ways to all endeavors and professions). The positives are easy for them to acknowledge, but their intense devotion to these objects won’t allow a thorough reflection. An alternative path is to apply the idea that we can be warriors when truly needed, competitive (but not cutthroat) in business and courageous enough to study methods from many other societies with a willingness to learn from them. By being more open to criticism and re-evaluation, we might find improved ways to better defend the nation and make a living. On one hand, the United States is well liked and admired for many reasons in many parts of the world – innovative, adventurous, diverse, humanitarian, productive. Otherwise, in spite of the negative characteristics that much of the world notices in our people – stubborn, cocky, violent, condescending, wasteful – let us not be so prideful and hardheaded that we are not able to use wisdom in correcting excesses and redirecting our social and financial resources wherever actually needed. At the same time, his administration’s diplomatic and economic interactions with the global community were received far more favorably than during the Bush presidency. Even though Republicans claim that Obama has no serious concern for the removal of government excess, he streamlined many segments of our national bureaucracy funded by America’s tax payers. For example, local, state and federal staffs were shrunk by 638,000 jobs by June 2015 (non-military). Compare that with the 1.7 million employees added to our public finance burden by his predecessor. 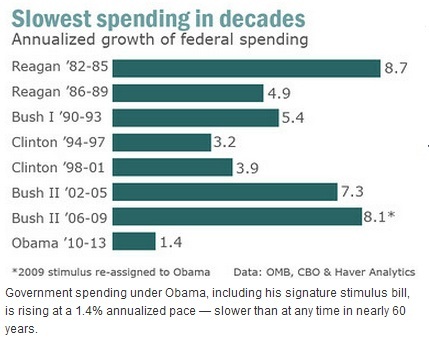 After all the heated talk about how Democrats and Obama specifically are exploding government in size and spending, it’s important evaluate that claim. Consider these results that the Pew Research Center released in January 2015, “Job shifts under Obama: Fewer government workers, more caregivers, servers and temps”. In the next post, I will explore the idea from many on the far-right that Obama is an extreme liberal who is destroying the American way of life. In fact, many researchers have concluded that he’s much more like what used to be called a moderate Republican – before the 1980s saw the party begin moving a long distance away from the middle. The Democrats then followed that general trend and largely ended up in the center. Next Should We Increase The Minimum Wage? I love this site. I’ve never seen any other source align with my political/societal outlook so perfectly (an eclectic mix of viewpoints borrowed from various ideologies mainly rooted in justification based on fact, data, objectivity, science, and history – and the general philosophy that many policies are well-intended but do not achieve their aim and make most/all of us worse, and certain policies can make everyone/everything better off, and that these should be identified and pursued for the well-being of all society). Great Work, wish more people had a better understanding of how the world works and how it intersects with politics. I think we often catch the tenets of our worldview like a common cold. From my experience, study and observation, I think it’s quite rare for a person to come to a viewpoint through dedicated application of logical analysis and attempted unbiased evaluation of evidence. That’s a very tall order, one that very few ever try to pursue, much less get close to accomplishing. Personally, I have tried to go down that route. I believe that I’ve made a lot of progress, but also recognize the stark limits within human psychology. I will always have blind spots. The encouraging thing is that we don’t need perfection. Instead, what will improve things is for more of us to make a better effort to humble ourselves intellectually, listen to others on the other side and try to understand why they think and *feel* as they do. And then compromise. It’s the only way live together. Grady commented on the article, but I wrote each of them for this blog site. Thanks for your feedback. It’s true that this article lists out mostly neutral or positive aspects of Obama’s terms. I think that most of the article can be said to be straight-forward reporting, even though the commentary certainly is not leaning far rightward. I’m an American and I’ve heard negative things about this president in such lopsided ways that his actual activities don’t get a thorough examination. I did include a link near the top of the page in the sentence: “One presents accomplishments and the other brings up failures.” The word “failure” connects to a site dedicated to criticizing Obama heavily: http://www.whatthehellhasobamadonesofar.com. I’ve written nearly 30 pages on the topic of “Has Obama Been A Successful President?”, but haven’t posted the other parts 2, 3, 4, etc. It takes a lot of time to write, edit and format these blog posts to the standard that I aim for. Your comment about wanting to read the other versions will encourage me to post them sooner rather than much later. If you “follow” my blog, you’ll get notified of each one as I add them online. In the meantime, I’d love to hear your thoughts on the other articles on this site. Obamacare is a great example of how a major aspect of political life used to be described as conservative by the Republicans until the party’s evolution into a far-right wing organization was complete. This healthcare plan was largely in line with and inspired by many influential Republicans during the past three decades. True left wing politicians would never approve of what was passed as the Affordable Care Act, yet conservatives have repeatedly added weighty drama to the zeitgeist with warnings that this extra liberal policy will bring America down into financial and social chaos. Leading presidential candidate Ben Carson said Obamacare was worse than slavery. That’s what any sane person would recognize not only as a false premise followed by a gross exaggeration, but also a piece of such reckless disinformation that it’s hard to believe a well educated physician and revered public figure said it. Of course, only a segment of the population admires this person and the kind of grandiosity that offers an inflated version of their wishes and biases. Liberals have their own tendencies to overstate or wildly mischaracterize the alleged worst villians on the other side, but the past decade has been filled with a disproportionately high number of loud Republicans saying off-the-wall things on a regular basis: Ben Carson, Donald Trump, Michelle Bachmann, Rush Limbaugh, Sarah Palin, Herman Cain, Todd Akin, Paul Broun, Louie Gohmert, Steve King and dozens of others. One simply has to type “crazy things republicans said” into a search engine online to get back a flood of quotes packed with absurdities not common in American politics for at least a half century. The principle is true for anyone who travels increasingly farther out on the fringe. They become ever more likely to state positions and form interpretations that are devoid of a well rounded factual foundation. Regarding the Affordable Care Act (ACA or Obamacare), healthcare experts and Wall Street analysts have reported that the industry, partly due to the new business created through this law, is doing quite well. The structure of the new system was in line with Republican plans of the late 1980s-mid 2000s, including ideas promoted by President George H.W. Bush, Newt Gingrich, John McCain, Mitt Romney, Dan Quayle, Orrin Hatch, Alan Simpson, Bob Dole and Donald Trump. 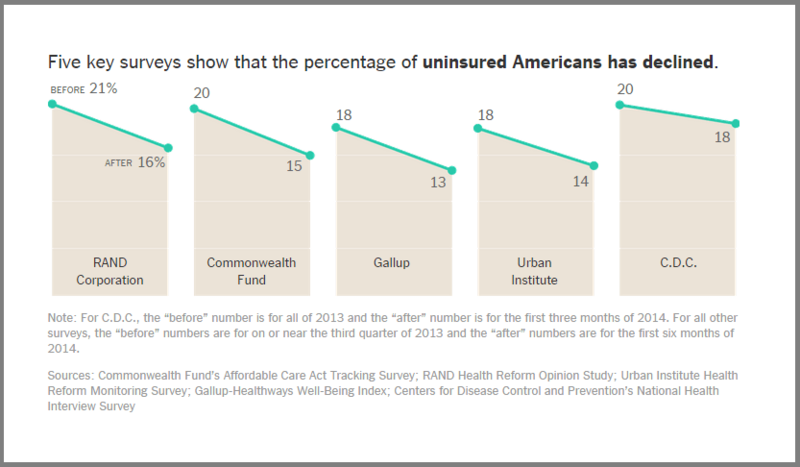 As of October 2014, the number of uninsured citizens had decreased by approximately 25 percent or between 8 and 11 million. These healthcare services have been available at prices that the majority of people could reasonably fit in their budget. Of those people who signed up within the normal enrollment period, 85 percent qualified for assistance in covering the cost of premiums through federal subsidies – which brought down the total amount by 76 percent on average. Many critics complained that the Obama administration had been disingenuous or even deceptive related to whether formerly insured Americans could keep their policy once the ACA became law. This may be a real mistake on the president’s part, especially in that he and his team did not clearly and consistently explain that only about half would be able to remain on their current healthcare plan. Even with this apparent misstep and the clearly terrible opening performance of the new web site for the ACA (which was corrected later), this new system has largely achieved a positive impact for Americans – as I showed evidence for above. That means the administration knew that more than 40 to 67 percent of those in the individual market would not be able to keep their plans, even if they liked them…. Was Obamacare a Republican idea? Regarding Denmark in comparison to the U.S., have you checked my article which compares all major quality of categories and finds the more extremely liberal or conservative countries to have the worst social ills? Also, did you know that when Forbes evaluated which countries were best for business in 2015, Denmark was #1? This was followed by New Zealand, Norway, Ireland, Sweden, Finland and Canada. By a large measure, they obviously do not agree with Tea Party policies of extreme libertarianism, yet no conservative country is near the top of this “pro-business” list: forbes.com/best-countries-for-business. The United States ranks #22. Wow Andy, I am very thankful to you for the amount of time and effort that you have put into this. As a Canadian who had great hopes for President Obama, the unfolding of the opposition to his Presidency by the Republican Party was in my mind, unbelievable. I don’t profess to understand the inner political workings of your system but from an outsiders perspective it became relatively clear to me very early in Obama’s presidency that regaining power at the expense of the nation was the prime objective of the Republicans. Actually I believe it started even before he took office. As a Christian I have always found it difficult to comprehend the hatred I see by Christians in the U.S for President Obama and I don’t use the word hatred lightly. I understand the natural objection to pro-choice and gay marriage etc but my thinking is that he is one man and the positives greatly outweigh the negatives. I am looking forward to the book that President Obama writes on his Presidency. I sincerely thank you for confirming to some degree what I suspected. And then we have the current election, really looking forward to reading what you have to say. I will be following your blog from here on in. Blessings. Blogging this much in-depth definitely requires a lot of work. 🙂 I enjoy the process and deeply care about getting information out to the public that might not be common knowledge. This article is part of a 3-4 part series that I didn’t finish editing. I plan to get that completed in the next month or so. In the meantime, I’ve almost uploaded a full 3-4 part article series on Trump. The first was posted recently: https://persuademepolitics.wordpress.com/2016/10/05/donald-trump-patriot-savior-or-tyrant-part-1. Thanks Andy, I’ll dedicate some time to this tomorrow. Well done! Senate Minority Leader Mitch McConnell said, “The single most important thing we want to achieve is for President Obama to be a one-term president.” As a republican I felt this is one of the most shameful things I ever heard. Are they there to obstruct or govern? I looked at the job growth/job added charts. They (and others not here) always seem to measure new jobs created as a mark of progress but I don’t think any of them are net growth because more jobs have been lost over last two decades than created and the new ones are very low wage and many merely part time. I can give just one example in that in Miami Dade County the unemployment rate is three to four times the reported rates. There is vast glitter and wealth there but 90% of kids in school system qualify for free or reduced lunch which is an indicator of all the other welfare for which those families actually do qualify. I’ve always wondered why communism(which is actually dictatorship of the right) is at the far left of the spectrum. Certainly I would think Marxism and socialism belong of the left but not communism. 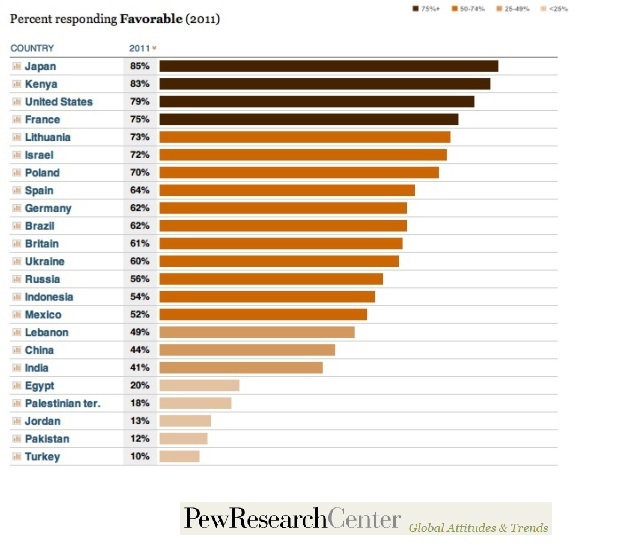 Did not see fascist theocratic Islam on that chart which must be the most repressive of all. Thanks for your recent visit to my blog.